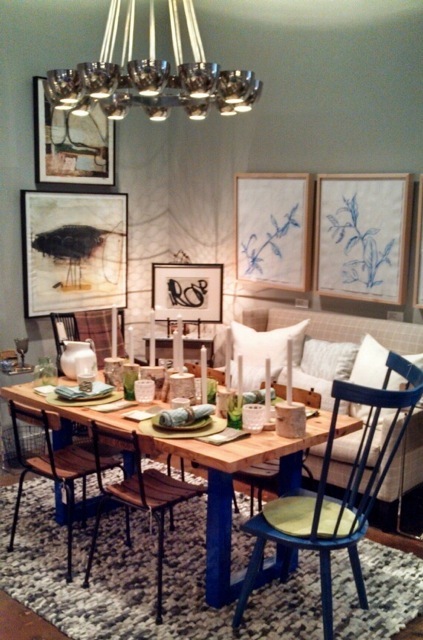 steve mckenzie’s Showroom Re-Do – And a New Colorway After the Holidays! Do we spy blue?!? Spring may really be on the horizon, even if our thermometers disagree. Blue offers us an easy, soothing transition into spring. This new table setting in our showroom incorporates spring blue with natural elements, and even a few polished items, offering a sense of casual elegance. We’ve also mixed up seating at the table with a painted blue chair situated at the head. Here’s a little tighter closeup – the wintery green tone is made fresh with birch candle holders (our homage to wabi sabi) and bright acrylic glasses. The napkin rings bring a touch of bling with them. 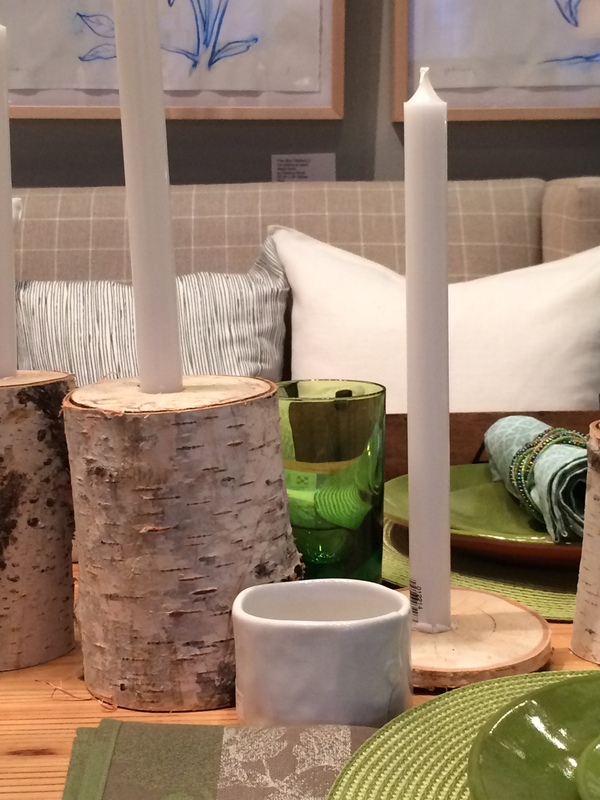 We always suggest mixing textures when creating any tablescape. From the mottled look of the handmade dishware, to the weave of the layered green place mats, mixing varying textures helps achieve interest and depth in design. 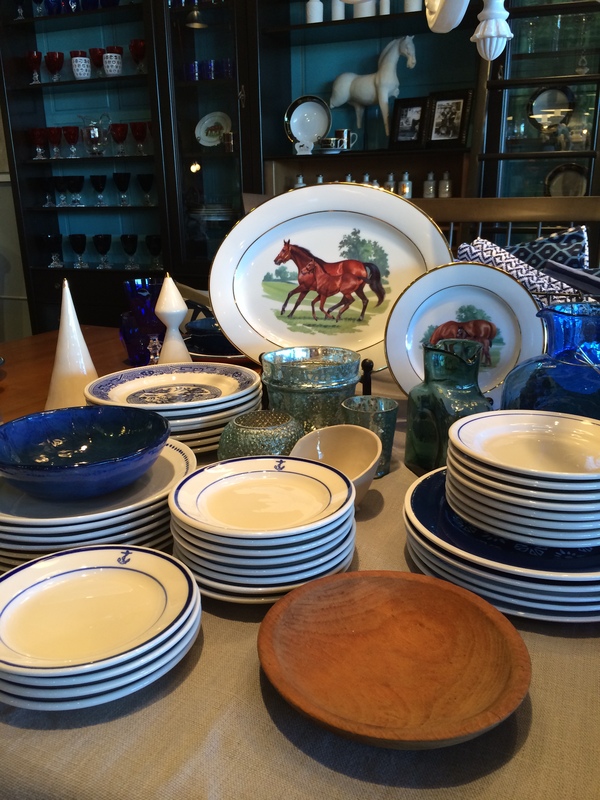 Our new vignette of Julie Wear’s Kentucky horses china mixed with r wood’s pottery in blueberry and vintage anchor dessert plates also plays off the blue hue introduced throughout the store. Sparkle is added with our mercury glass centerpiece filled with winter greenery. After all, any makeover, whether in a home or store showroom, needs a bit of bling! 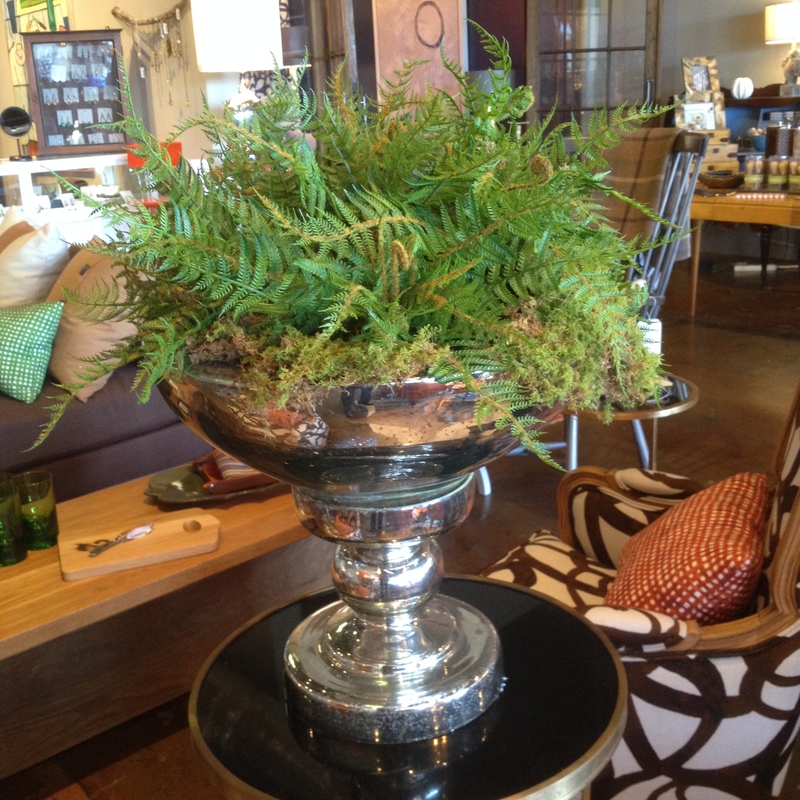 And this centerpiece was simple to create… Bring together a dramatic vessel and fill with delicate greenery and moss. Utilize it as a focal point, or place in a corner to add a touch of softness. We hope you’ve enjoyed our tour of our revamped showroom – hopefully we’ve inspired you to make some spring-inspired updates to your home. Cheers to the new year and a fresh look at steve mckenzie’s! *Click here to view the wide range of dining and entertaining products available at steve mckenzie’s. Great transition ideas from holiday decor to something fresh and new without stepping right into Spring. Love the blue and white which works so well with so many other traditional and trend colors I’ve seen in your store.